Dan Clements scored twice for Peterborough Sports at Potton. Leaders Peterborough Sports emphasised the gulf in class between themselves and the rest of United Counties Division One with a 4-0 win at fourth-placed Potton last night (March 8). Sports are now 18 points clear at the top with nine games to go. Vistory at second-placed ON Chenecks on Saturday (March 12) would all but assure them of promotion thanks to their vastly superior goal difference. It didn’t Sports long to stamp their authority on last night’s game as Josh Moreman struck after just two minutes. It was 2-0 midwy through the half thanks to a Dan Clements goal and two goals in the final 10 minutes from a Potton player and Clements completed the scoring. 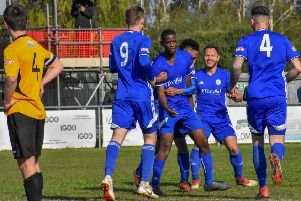 It’s been a wonderful season for the city club who are also through to the finals of the Northants Junior Cup and Hinchingbrooke Cup and the semi-finals of the United Counties League Cup. The Northants Cup final against Peterborough League Premier Division side Netherton will take place at Peterborough United’s ABAX Stadium on Tuesday, April 26. It wasn’t such a good night for March Town United who lost their Thurlow Nunn Division One League Cup semi-final 3-0 at home to Haverhill Borough. The Hares suffered for not taking their chances when on top in the opening 25 minutes, Haverhill were more clinical and lead 2-0 at the break before adding a third goal late on from the penalty spot. Holbeach United’s United Counties League Cup quarter-final with Boston Town at Carter’s Park tonight (March 9) is subject to a pitch inspection following heavy overnight rain. Wisbech Town are awaiting the winners. Sports tackle Premier Division Cogenhoe in the other semi-final. Peterborough Sports 4 (Clements 2, Moreman, og).